If you would like Woodman’s to consider your organization for a charitable donation, please fill out the PDF form below and submit - along with any other materials - to our Corporate Office at least 30 days prior to the event. If you would like Woodman’s to consider your organization for a local advertising opportunity such as sponsoring a Little League Team, supporting a Music Festival, etc. Please fill out the PDF form below and submit - along with any other materials to our Corporate Office at least 30 days prior to the event. At Woodman’s Markets we strive to be an integral part of the communities in which we live and work every day. We want to support causes that directly impact you, our customers, and your families, on the home front. To accomplish this, we focus on a broad array of causes that promote healthy communities, from children to seniors, including local schools, for all ages and abilities. 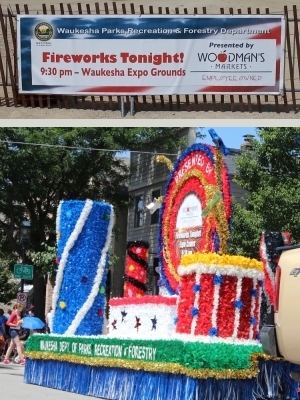 Woodman’s is also a long-time champion of local fireworks celebrations and city festivals that promote strong and vibrant cities and neighborhoods. Some of the hundreds of organizations we support include the local chapters of national organizations including American Red Cross, American Cancer Society, Boys & Girls Clubs, Goodwill Industries, Make-A-Wish Foundation, March of Dimes and Special Olympics. We also support dozens of pancake breakfasts, walks, fun fairs and other fundraisers at associations, churches and schools every year.